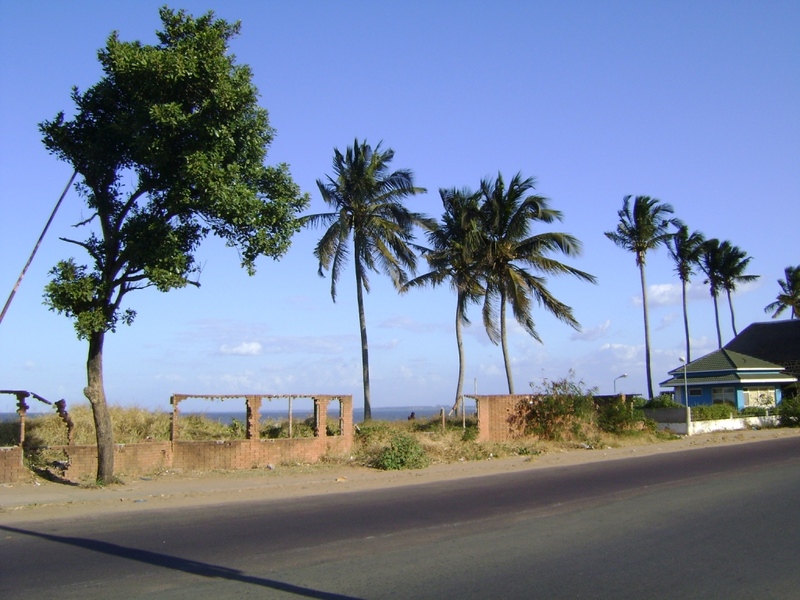 Mozambique struggled for nearly 20 years with a bloodly civil war, the scars of which are still evident in some parts. Today, though Mozambique is a growing destination for tourists particularly for its golden beaches, incredible coastline and water activities. Currency: The Metical is the currency. The conversion rate is $USD1- 35M or $AUD 30. Sporting Trivia: Maria Mutola is was the gold medallist in the 800m women’s race at the Sydney Olympics in 2000. At the 2008 games she became only the 4th track & field athlete to appear at 6 games. She is the only person to win any medal for Mozambique, she also picked up bronze in 1996. The traveller scene is booming after the World Cup, predominately in the south of the country. Venture north to navigate the sheer size of Mozambique and you’ll find it pretty difficult as the roads still require a lot of work. A few days travel here can easily turn into more than a week long adventure as we experienced first hand. Visa Requirements: It may just be the largest visa in the World, you’ll need 2 full pages. Most nationalities can get this on entry and coming in from Swaziland this only took us about 20 minutes along with 1 passport picture and 380M ($13). The Lingo: Speaking English will get you around about 50% of the time. It was colonised by the Portugese so a few lines of Portugese will go a long way when you are trying to buy some seafood or ask for some peri peri sauce around town. In Maputo you will be able to get away with English but elsewhere in the country it is definitely more than useful to read up on the basics. 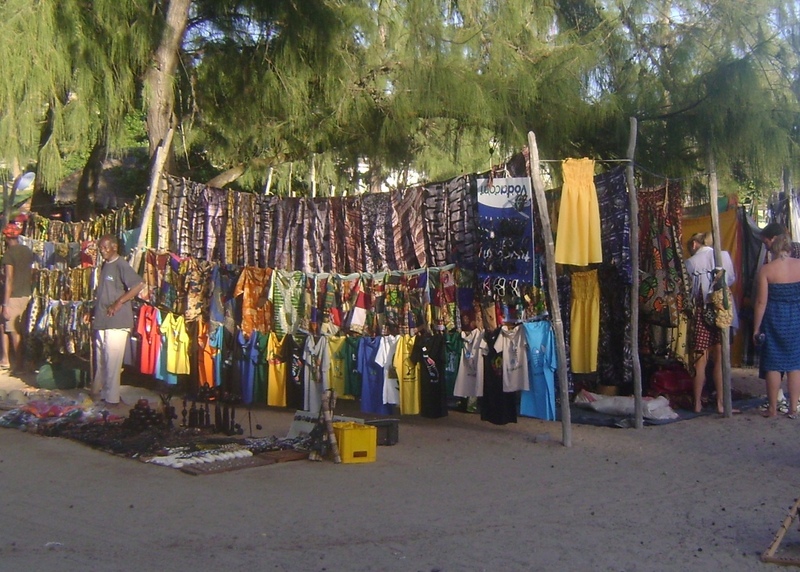 Swahili, and Makhuwa are the most spoken indigenous languages of Mozambique. The beating heart of Mozambique has a cool vibe wherever you are. It is clearly the most ‘western’ city in Mozambique and you can live it up whilst in town. This metropolis offers much more than the normal city sights but also serves as gateway to a number of golden islands. It is a must do if you are in the east of Southern Africa to feel the difference between this former Portugese colony and the rest of the region. How did we get there: Shared taxi from Manzini (Swaziland). The trip took about 5 hours and cost 70R ($10). You will be offering plenty of opportunities to get rid of any Swazi currency you have, this is the sort of currency you don’t want to be left with. Where did we stay: Fatima’s Place on Mao-Tse Tung Avenue. This is a pretty well known backpackers in town and has a self catering kitchen. There are private rooms and a dorm room will set you back 400M ($14). Yep – it’s overpriced. On the town: In a word – Coconuts. This place has to be one of the greatest nightclubs in Africa. That’s right this is where the rich and famous hang and you’ll see why. It is a massive complex which holds easily over 1,000 party goers, has 3 seperate dancefloors, a pool complete with swim up bars and blasts beats all night right on the beach. It’s open Friday and Saturday nights and it’s where you need to be. There is a great jazz/karoake bar Gil Vicente that draws a big crowd all through the week. Why? Because you can jump on stage and jam with the guys with a reggae jam session on Saturday and Tuesday night it’s home to Mozambique’s biggest Karaoke night. Learn from us: In this part of Africa the currency of choice is the US Dollars. This is what you want need to use to pay at embassies. There are plenty of change officers around just make sure you get notes after the year 2000. Nobody wants anything to do with a any note that is pre ‘99. This applies it seems all across the east of Africa. It is a requirement to carry your passport with you at all times. We do not encourage breaking the law, but if for some reason you forget, or don’t want to take your passport for security reasons then calling an interested police officers bluff and saying let’s go the station seemed to do the trick when we were stopped for money. Traveller scene: Maputo was packed with travellers of all descriptions. A lot of people had come up to check out southern Mozambique after the World Cup. You can head out to the major spots and find travellers along with plenty of expats working in Maputo. The highlight of a trip to Maputo is heading down to the pulsating fish markets. Their are a bunch of touts here and you will pay more than at a more local place, nonetheless it is a cool experience buying some prawns at the market and taking it to a restaurant to get cooked up in delicous local sauces. 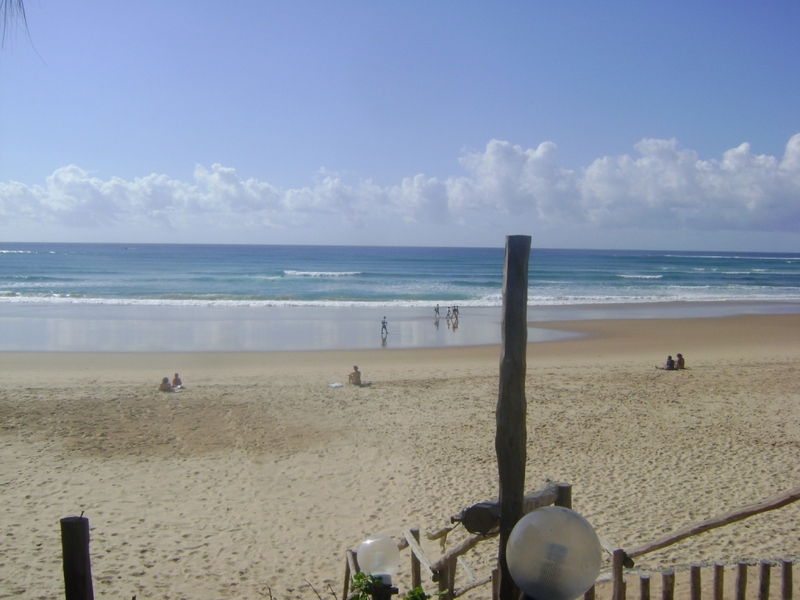 Boasts beautiful beaches, and chilled out beach vibe what more can you ask for. Unfortunately, this beachside paradise was spoilt by local police officers. Our most horrific story. Hence, we got out of the place as soon as we could bound for destinations further north. We hope this problems with local police corruption can be soon fixed to ensure this place gets the tourist attention it deserves to ensure people get to see Mozambique at its best not its worst. How did we get there: Fatima’s runs a minibus for travellers at 5.30am to Tofo. The trip took us about 9 hours, including wasting about an hour on the edge of Tofo as the police decided to check every single bag. The cost was 600M ($20). You can do it cheaper by getting a mini-bus to Inhambana and on to Tofo but it might be a slightly more comfortable experience for a bit extra to do what we did. Where did we stay: Fatima’s, yep we were lazy as we got dropped off there. There are other places that are more highly recommended just up the beach. A dorm will cost you 400M ($14). Getting a feed: Walk into town and you’ll an amazing assortment of fresh foods at the markets. We tried to put together a few basic ingredients but as it turns out this doesn’t really work – it’s more expensive than iheading to a local take-away store. Africa doesn’t really encourage you to cook in when you can find such cheap and normally tastier options on the street. Fatima’s has a reasonably priced restaurant serving cheap sandwiches and salads. Out on the town: Tofo is home to full moon parties that draw big crowds, although without the Thailand style craziness. We weren’t there for this so normally Dino’s is the bestside bar with the most to offer, unfortunately it was a Wednesday. Fatima’s bar has a bit of a dancefloor and nearly everybody from the surrounding area drops in. Security seems a major issue here and we were part of a major incident that went down this night. Learn from us: Don’t get there on a Wednesday, for some reason it’s the only night ever that Dino’s is closed. Traveller scene: Plenty of tourists make the trip up here from Maputo and it’s about as far north as most travel in Mozambique. There are also plenty of South Africans who were enjoying the longer winter break by the beaches. It’s another 8 hours north of Tofo. Velenkulo comes packed with fishing boats, golden beaches and friendly faces with a busy village vibe. How did we get there: From Tofo we jumped on a shared taxi to Inhambane for 25M (75cents) for 20 minute ride. Then jumped across for a ferry across from the peninsula to Maxixe. We anticipated a ferry service but instead had the more genuine experience on board a small boat to get across the shallow inlet. This was 20M (66 cents) each including the baggage. In Maxixe you’ll find taxi’s bound for Velenkulo and for the most part roads for most of the journey are alright. In saying that, it took us about 7 hours to make it up there. Where did we stay: Boabab Backpackers was our destination. The international staff here dominate. It’s on the bay where you can walk 20m to purchase the day’s catch and cook it at the in house kitchen. Boabab has privates, camping and some big dorms so take your pic. More impressively there is a good bar area, with pool, local cocktails and local cuisine. Best of all – it’s cheap. Getting a feed: The markets are a pretty cool spot to get whatever fresh produce you’re after. You’ll find some real bargains if you venture off the main street and combine that with fresh seafood in the afternoons and you’re set. Out on the town: Our two attempted to get north to Beira at 4am meant the boozing was reduced here. 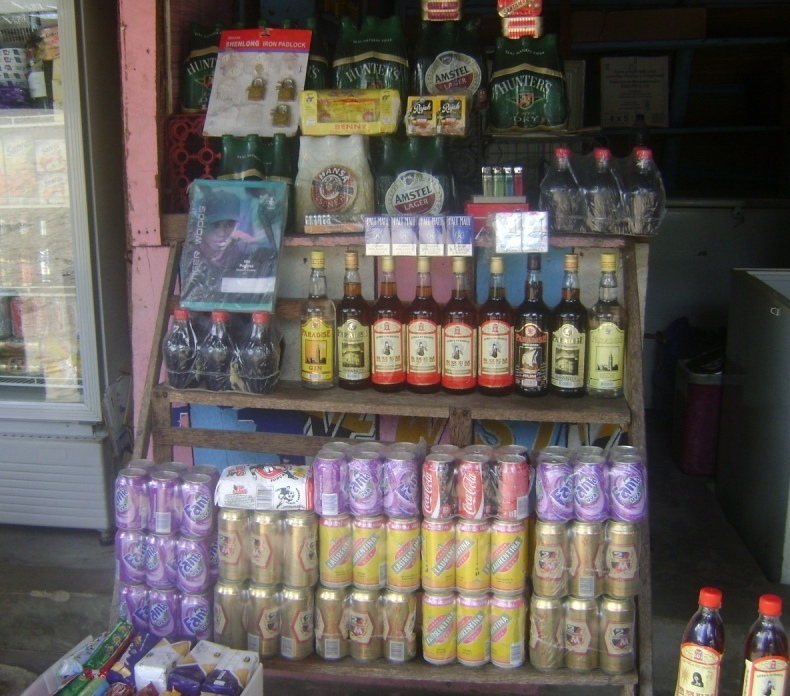 The backpackers had a good bar set up and it’s a good place to start before finding the infamous Afrobar. Make it there and out alive, well, it’s a wild night out. Learn from us: Book your tickets the afternoon before if you want to head north. 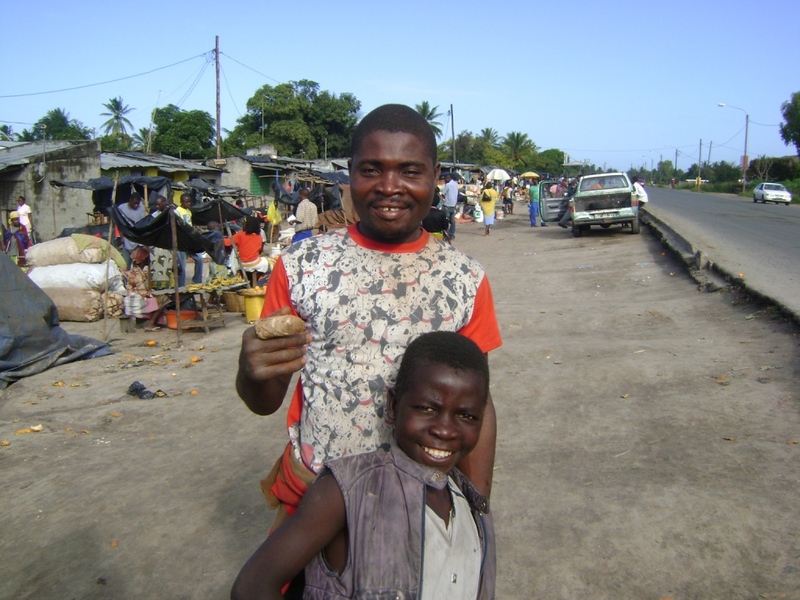 Get the information beforehand, as the buses don’t necessarily leave everyday to Beira. So save yourself a 3.30am wake up, get the info right and you’ll only be doing the death early morning walk once. Traveller scene: Velenkulo, whilst not teeming with tourists draw a crowd. There are 3 or 4 backpacker style options here. When we were there massive groups of Dutch and South Africans making the most of the coast. It’s cheaper than it’s southern rivals and with the village backing onto the backpackers it’s pretty much ideal. Mozambique’s second largest city isn’t exactly known as a tourist destination and nor should it be. It does have a lot of expats working at the city’s large port along with volunteer projects. It serves as a stop on the way to the northern extremities of this country, there isn’t a lot to do here but if you know some people here you’ll have a pleasant stay. Where did we stay: At a local volunteer’s place who is working with a local school and involved in improving rural literacy on the outskirts of Beira. Accommodation is a problem in town but you’ll have no problems finding ex-pats or local families to put you up. How did we get there: It was horrific. We took a mini bus. The drive shaft snapped after 2hours in the middle of the desert on the highway. There was a mechanic on board who said he’d never seen anything like it, needless to say nor had we. Not wanting to wait 3 days we hitchhiked on a bus decked out with beds. It was weird and expensive but after 7 hours we made it to the edge of town before getting into the back of a dump truck for the last 5km. Getting a feed: Head into town, just next to the market and find the best bargain chicken in Mozambique. 50M ($1.70) for a 1/4 chicken and chips with of course peri-peri. We found the best and worst of service here. The next day we just wanted a plate of chips which ended up taking over an hour served icy cold. Out on the town: Local bars. Cheap beers. Every street. Take your pick and enjoy the Portuguese banter. Learn from us: Can’t go past 20M (66 cents) for a plate of chips? Neither can we, but be warned this could take over an hour. Luckily enough we had some outrageous Brazilian TV game shows on to make the time fly by. What do they watch in Mozam? Think trans-sexuals, beautiful women, football shoot outs and bad acting and you get the picture. We never anticipated stopping here in our ambitious effort to reach Malawi in a day, however Tete was a pleasant surprise. Set on the banks of the Zambezi River, Tete stands out as a city with a lot of develpment and opportunities for future growth across the board. How did we get there: We jumped on a bus from Beira at 6am. This leaves every 2nd day so don’t just get up the morning before and think you can just show up. Head to the bus office the afternoon before to grab your ticket. It is a pretty nice bus, although a 2 hour breakdown stopped our progress. It cost about 350M (AUD$12) for the journey. 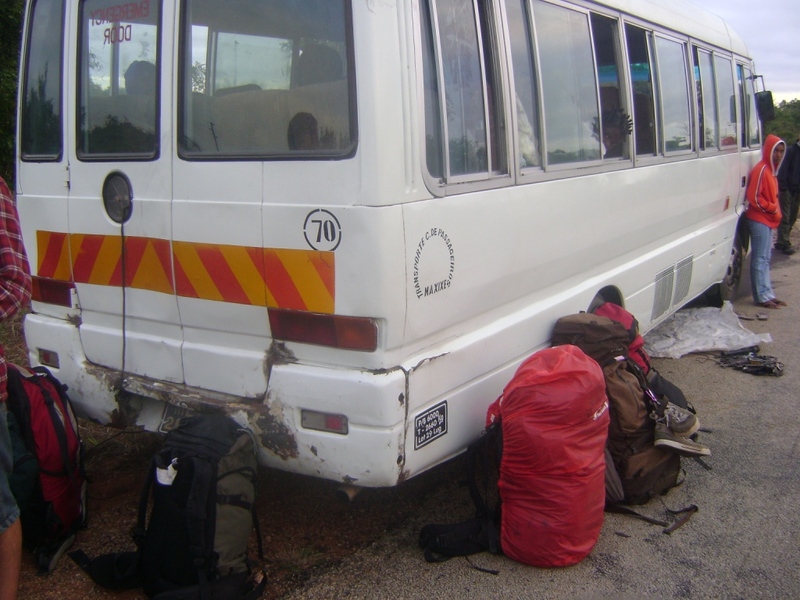 Let’s be honest – transport is not Mozambique’s strong suite. Where did we stay: Paradise a hotel under renovations adjacent to Sundowners on the highway into to town. A room here will set you back 1000M ($33) for a twin room. Out on the town: After 10 hours travel where can you find a place to relax? Sundowners as the name suggests is the perfect place to relax with one of Mozam’s finest beers on the banks of the Zambezi as the sunsets. The staff here have relocated from Zimbabwe and jump at the chance to speak English so play your cards right and they’ll even share their dinner with you! Highlight: We wanted to like Mozambique, but the police corruption and transport difficulties made it hard. We have to admit we were very relieved to make it to Malawi and exit Mozambique. In all fairness though, Coconuts nightclub has to be one of Africa’s best and the chance to try out some basic Portugese is something new for us in Africa. Biggest surprise: To be honest it has to be how hard it was to find peri-peri chicken that is so famous from these parts. Apart from the outskirts of Maputo, street side peri-peri chicken was hard to come by. You can of course grab peri-peri anywhere. One thing you can do to break down a barrier: We had direct experience with police corruption and crime in Mozambique so it is important we raise this as a key issue holding Mozambique and its citizens back at the moment.